I’m in love with chalk paint! Seriously, it’s the best paint I’ve ever worked with. It goes on smooth and easy, and it has great coverage capabilities. You can use it almost any surface, too. Best of all, you don’t have to use your elbow grease sanding and stripping in order to prepare your painting surface. 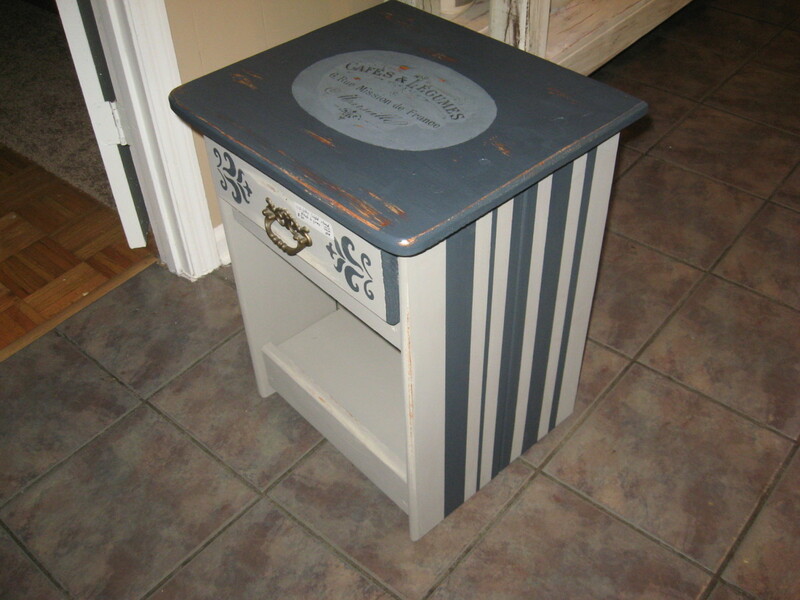 I’ve used several types of chalk paint, including Annie Sloan paint and Ce Ce Caldwell paint. I’ve also made my own chalk paint using latex and plaster of Paris. In all honesty, my favorite so far is Annie Sloan. Yes, it’s expensive, but I think it’s worth the price, especially when you want one of the beautiful shades she offers. If you’re interested in doing some chalk paint projects, I have some ideas and tips for you. I think I’ve become a furniture and décor upcycling addict! Personally, I really like the look of distressed furniture. Some people just don’t “get it,” however. My husband is one of those individuals. He laughs when I go to the trouble to paint a piece and then spend time removing some of the paint I just applied. 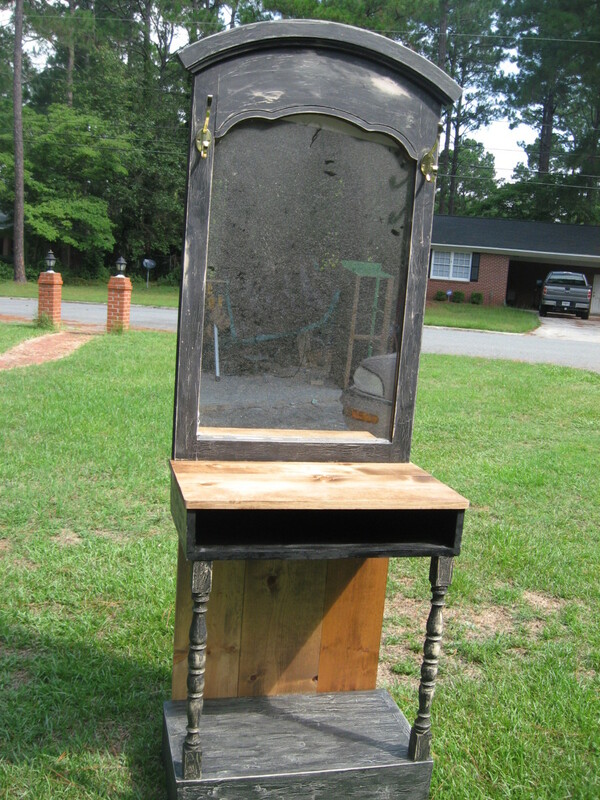 I suppose it does seem ironic, but that’s how to get that old, beat-up look – shabby chic, as it’s called. 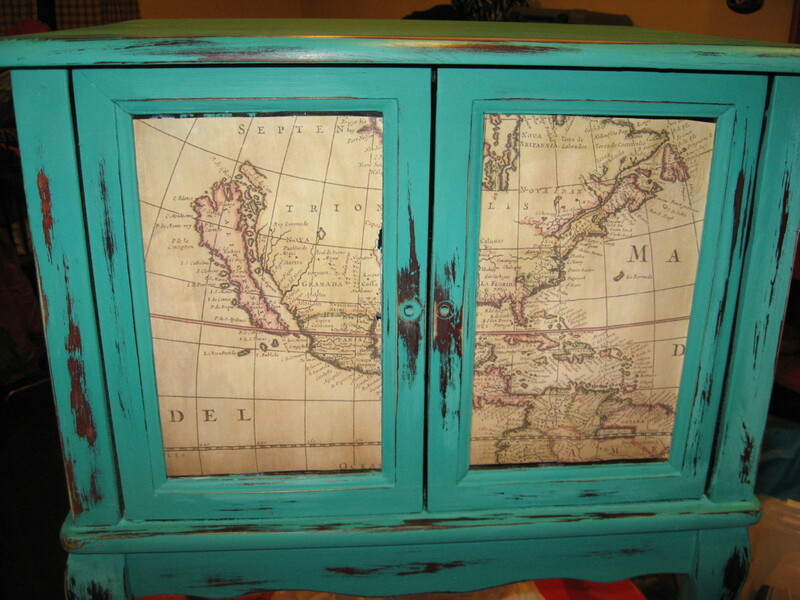 There are several ways to get the distressed, shabby chic look. 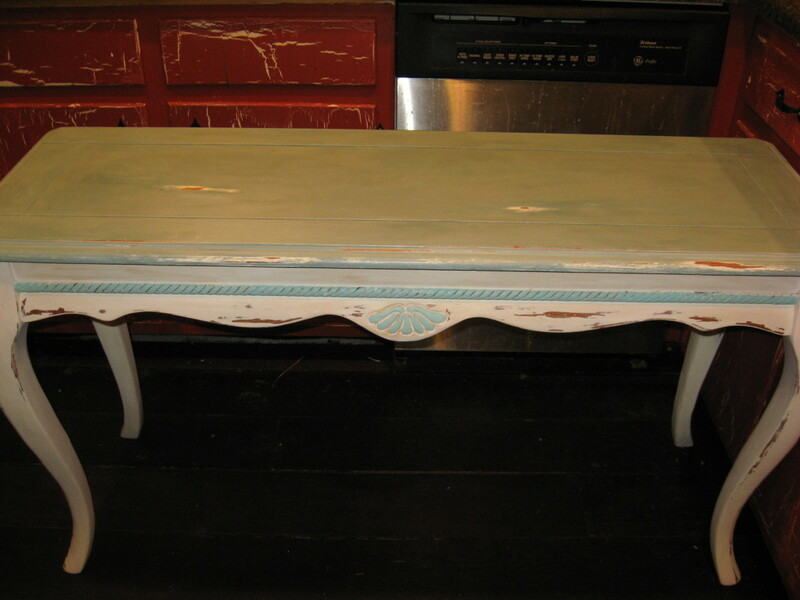 Once chalk paint is dry, you can usually remove some it with a damp cloth. 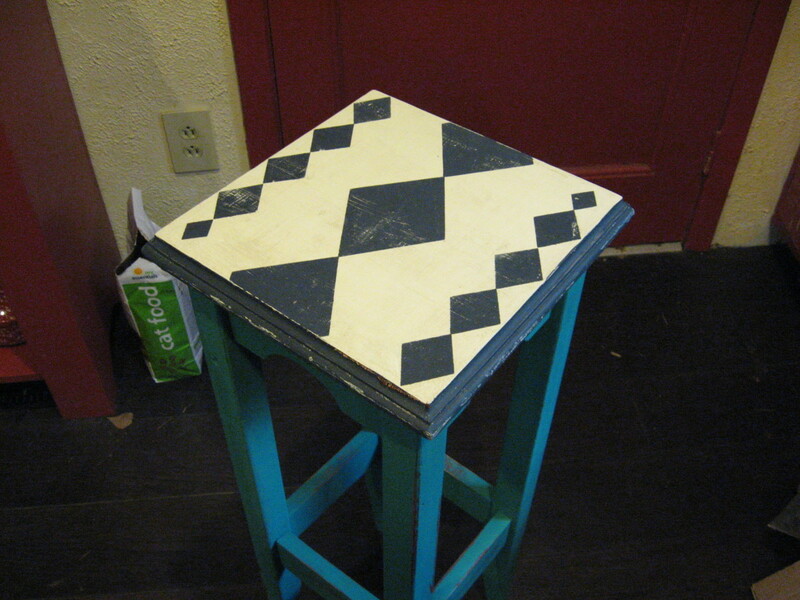 You can also use sandpaper to age a piece of furniture. If you want a really distressed look, you might even want to scrape off some of the paint with a paint scraper. Some people use steel wool, but I haven't tried that...yet. Just make sure your distressing is done in a more or less random way. You’ll want to think about places on the furniture where it would normally get extra wear. For example, around pulls or knobs, corners, and legs would likely show more wear in the real world. You might also want to experiment with washes, or water-based stains. For a whitewashed effect, mix white paint with water until thin. Paint it over your surface and wipe away some with a damp cloth. For an aged look, you can do the same thing with a brown wash. For the number two and number three photos above, I used water-based Cabot's stain and polyurethane in one. To use it an aging element, thin the stain with water. Brush it on, or wipe it on with a soft rag. Keep a damp rag on hand to wipe off any excess. If the stain is too dark, just wipe some off with the damp rag. 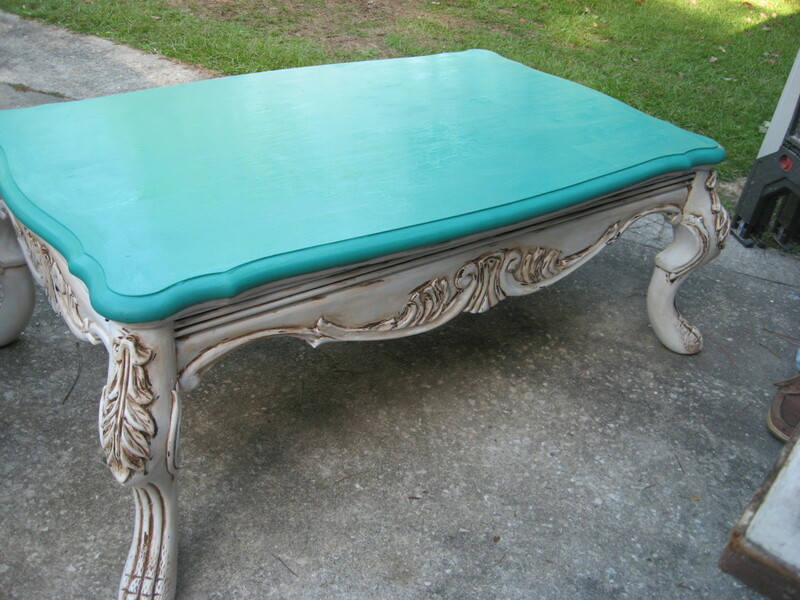 Yes, chalk paint looks great with a crackle finish. You can use a commercial product, or you can do it the cheap and easy way with plain liquid school glue. How? 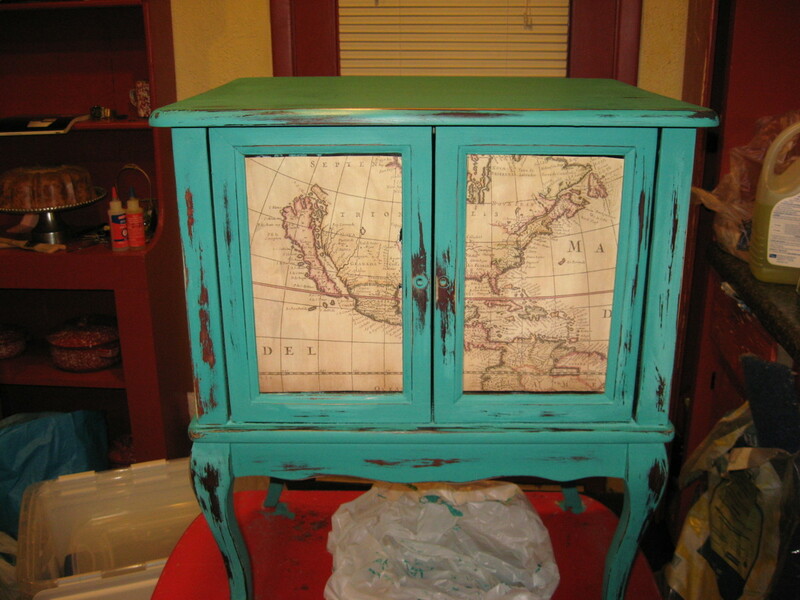 First, paint the item the color you want with chalk paint. I suggest using a pretty heavy coat. When the first coat is completely dry, paint the item with the glue. Work quickly! While the glue is still a little wet, paint on the second coat of paint. the first coat is the color you’ll see in the cracks. To get a really neat finish, you can use several coats of paint, each in a different color. Once the last base coat is dry, use the glue and your top coat. That’s how I did the small wooden bucket in the above photograph. When the top coat of paint was dry, I peeled away and scraped a little paint at random spots, removing different layers. At some spots, I removed just one layer, but at other spots, I went deeper. You can achieve a beautiful piece of chalk paint furniture by just painting it and distressing it – even with just one color all over. 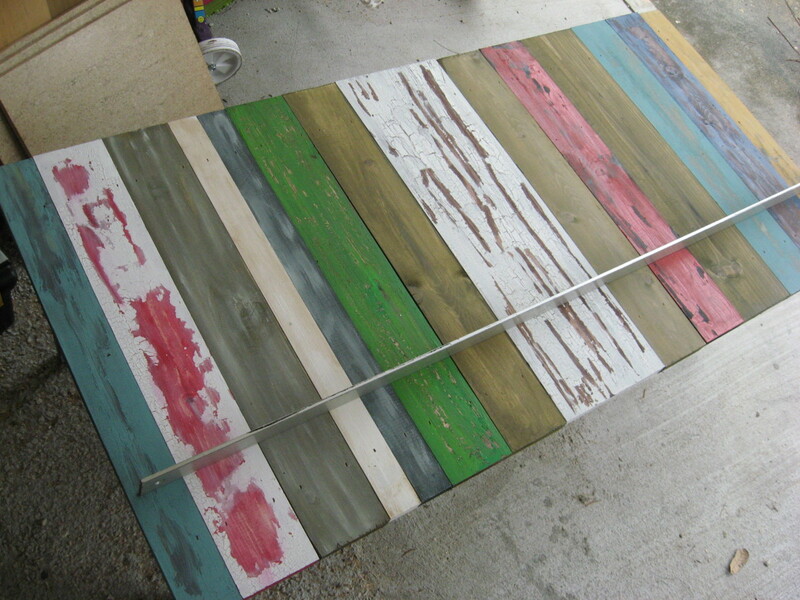 Of course, some pieces are more interesting with more than one color or shade of paint. 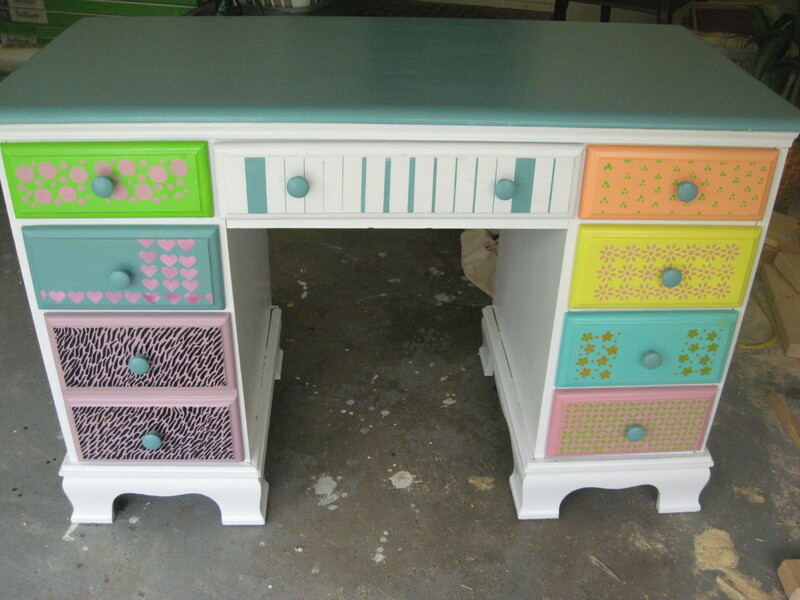 You might want to paint different parts of a piece of furniture in different colors. 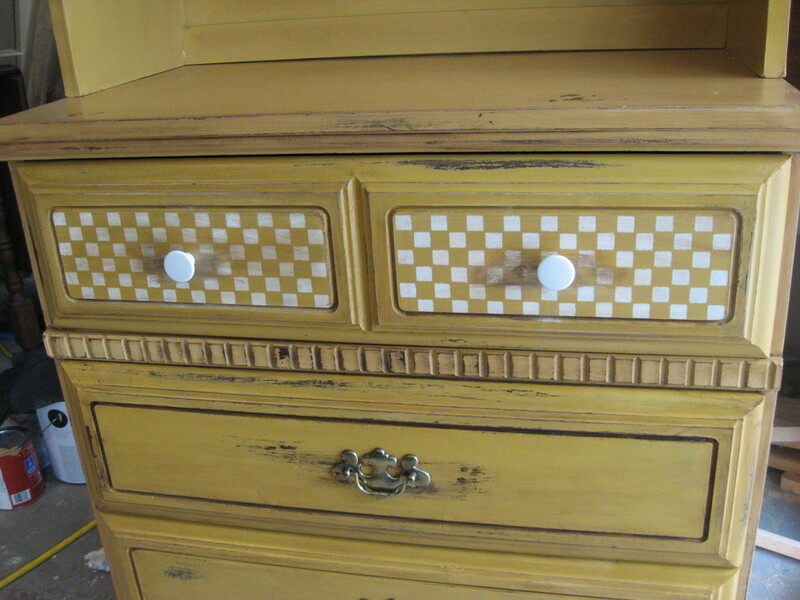 For example, you might want to paint the top of a dresser vintage white and paint the drawer fronts graphite. For pieces of furniture that have moldings or trim, you might want to think about painting the trim work a different color than you use to paint the rest of the piece. 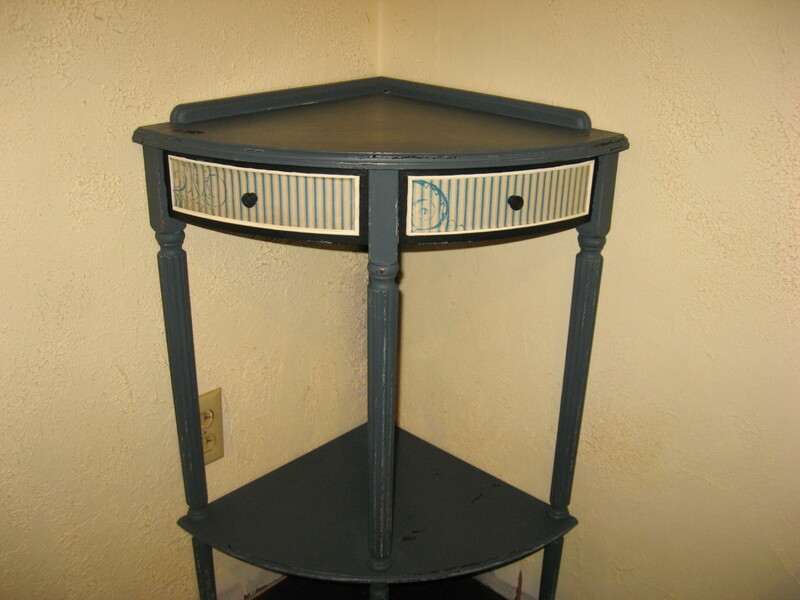 I don’t know if you can tell from the photo above, but for this sofa table, I painted the top a grayish blue, the front and legs old white, and the trim a lightened shade of Annie Sloan Florence. I really like the contrast! 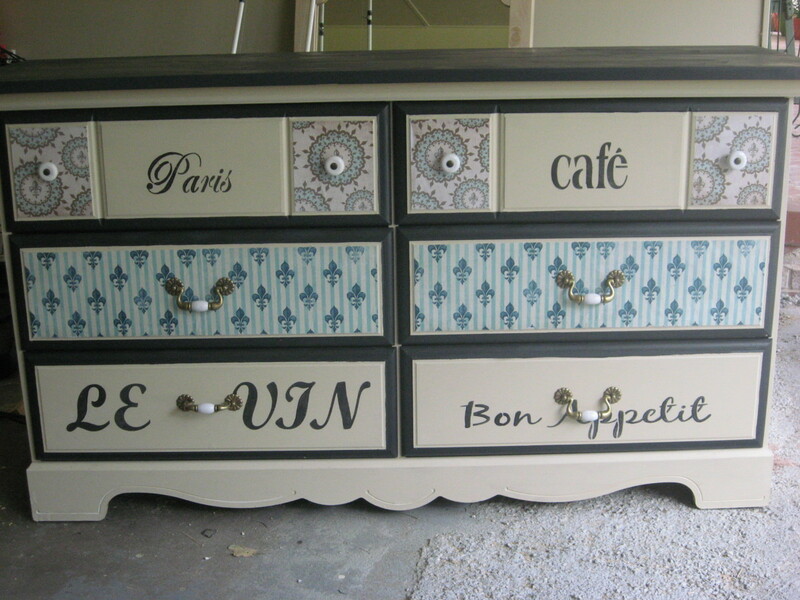 Another way to add interest to chalk paint furniture is to use decoupage. Personally, I like to use paper that looks old or old fashioned. 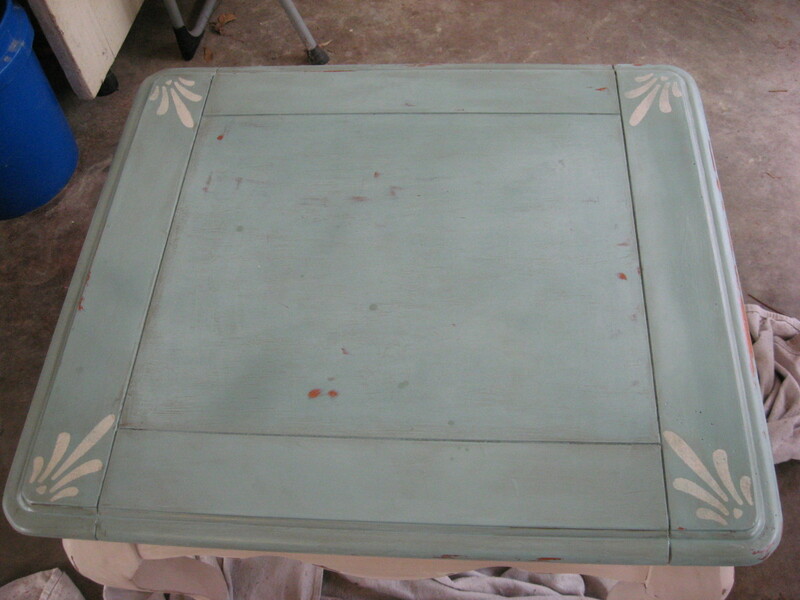 So far, most of my decoupaging on chalk paint furniture has been with scrapbook paper. 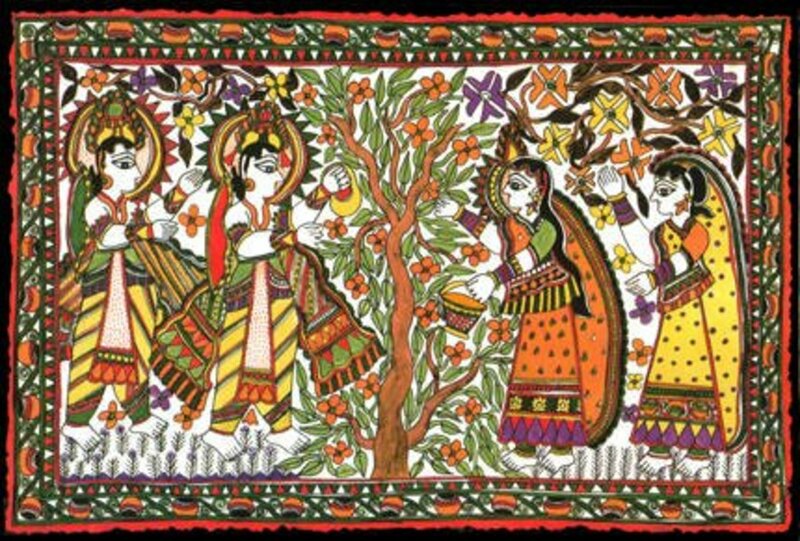 You can find a whole book of it for $5 at Walmart, and it comes in some beautiful prints and patterns. You can also find it with script. See the cabinet in the top photo above? It used to have two glass doors on the front. I never liked the doors, so I covered them with old map paper I found. It was easy! I just cut the paper to fit the glass, and then I used decoupage glue to stick the paper to the glass. Next, I covered the top of the map paper with more decoupage glue. 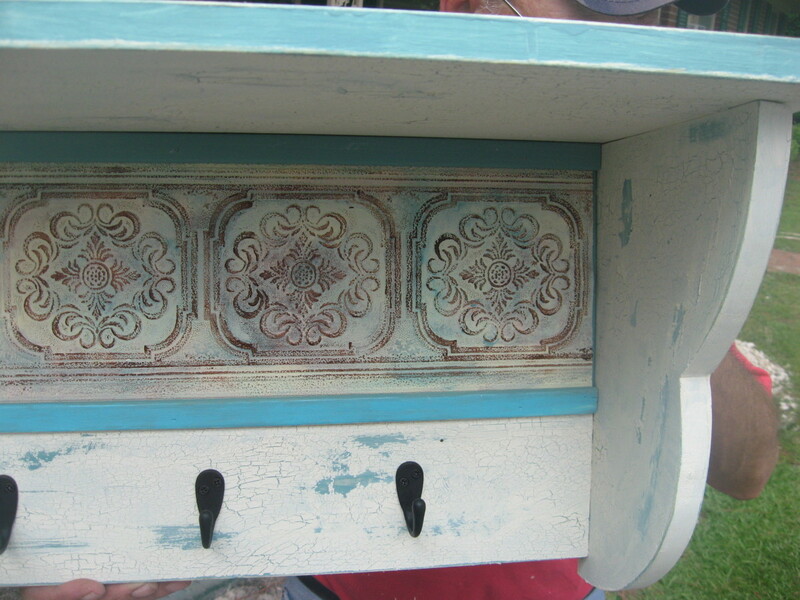 Drawer fronts are other places you might want to think about adding decoupage to your chalk-painted furniture. In the second photograph above, you can see how I used a paper with a small stripe to add some interest to a corner cabinet. 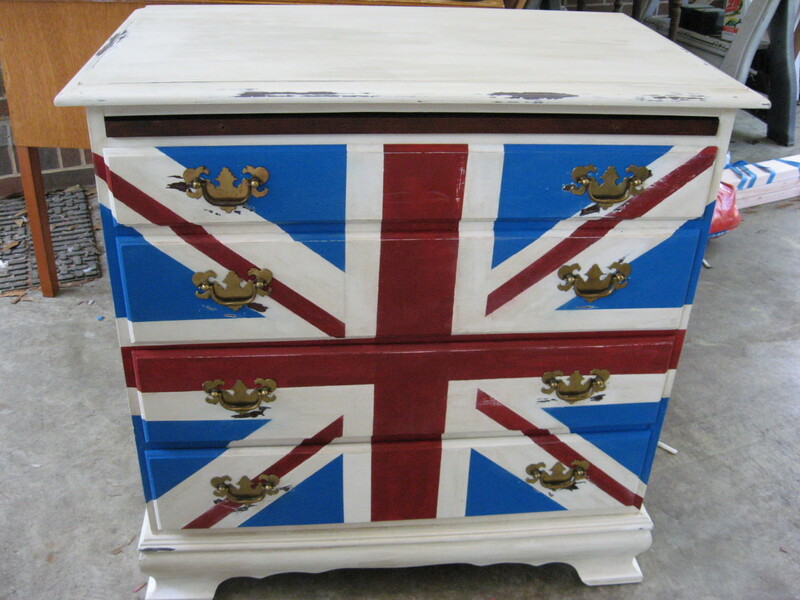 Want a different way to add some interest to your shabby chic, French Country, or cottage furniture? Well, sometimes I use acrylic paints – either folk paints or artist’s paints. If you’re not good at free-handing designs, no problem! Just use a stencil. See the tea cart in the top photograph above? 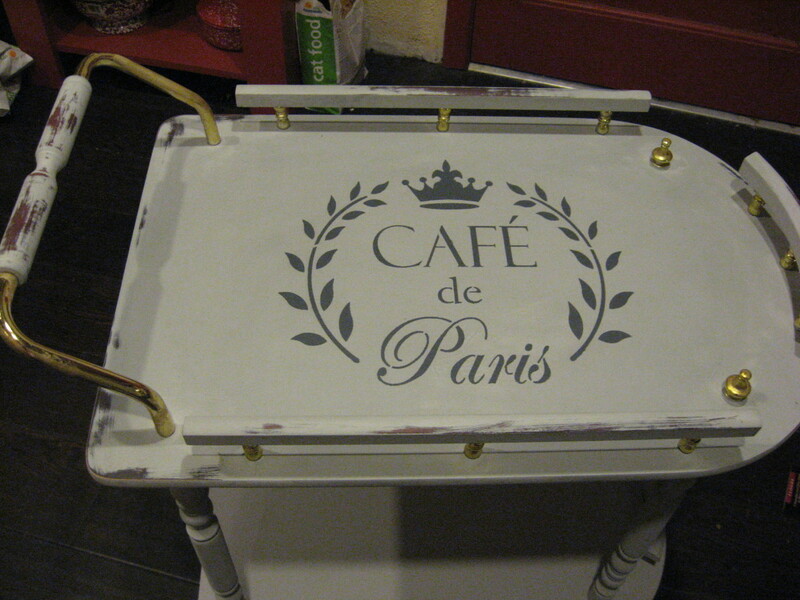 I used a stencil to create that script on the painted tea cart. 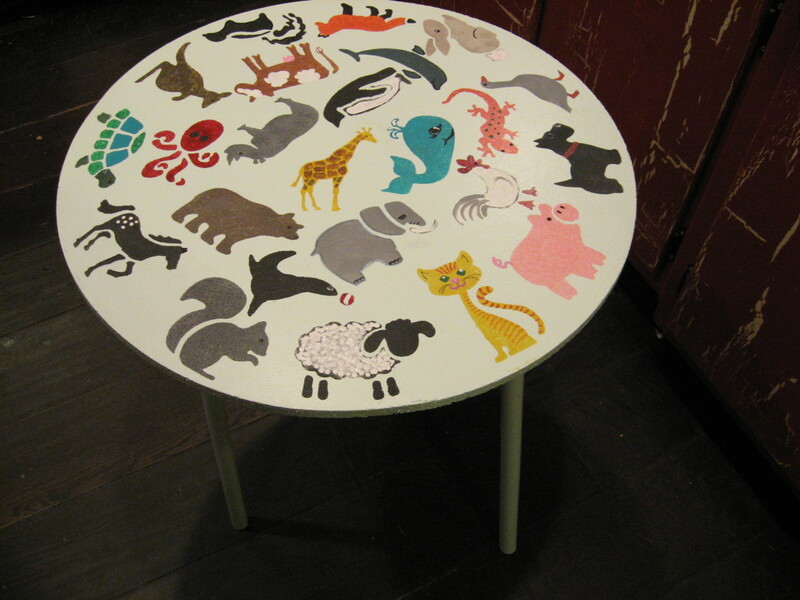 On the second photo above, I used cheap stencils from Walmart to make animals on this children’s table. 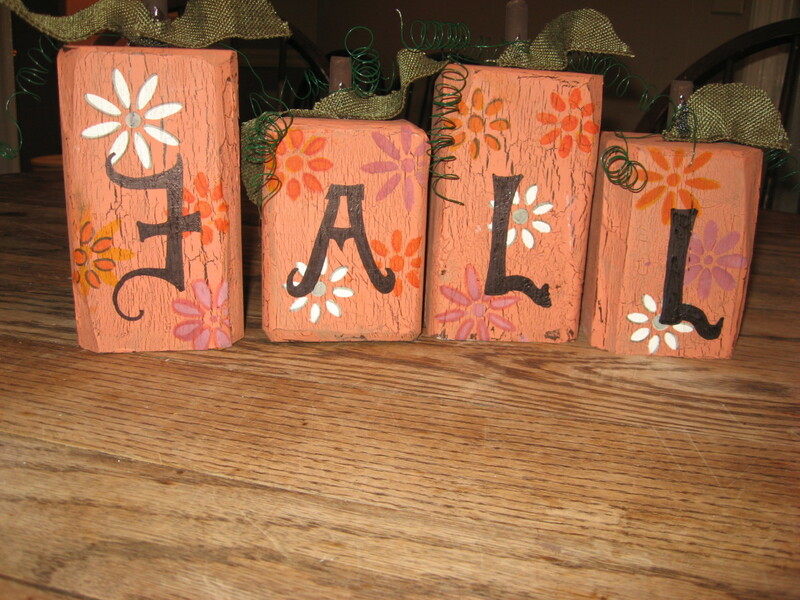 It’s easy to add lots of details to stenciled designs to make them more interesting. 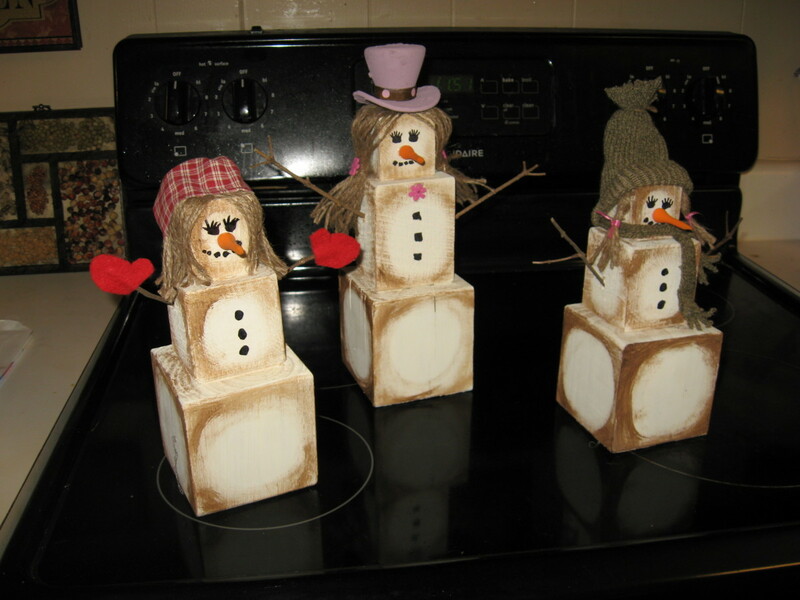 Add details with a tiny paint brush or with paint pens. 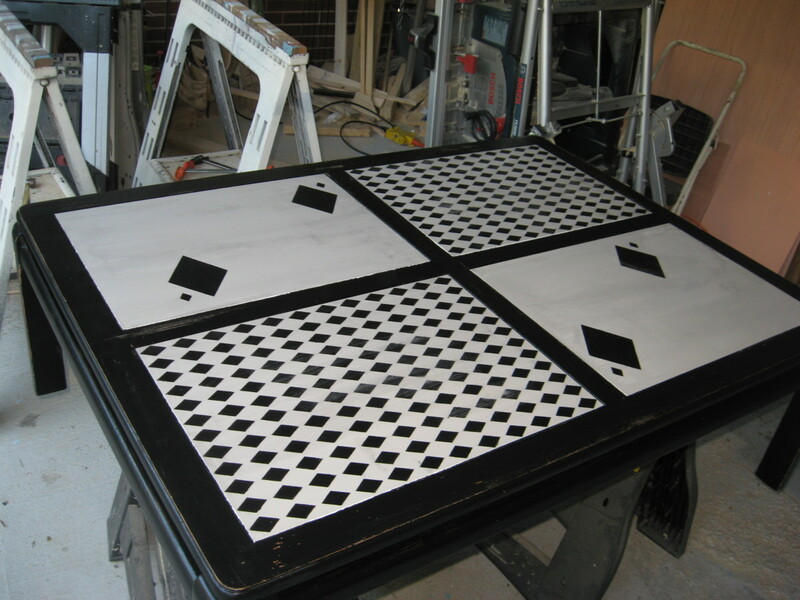 On the next photos above, I used stencils to create harlequin patterns on table tops. 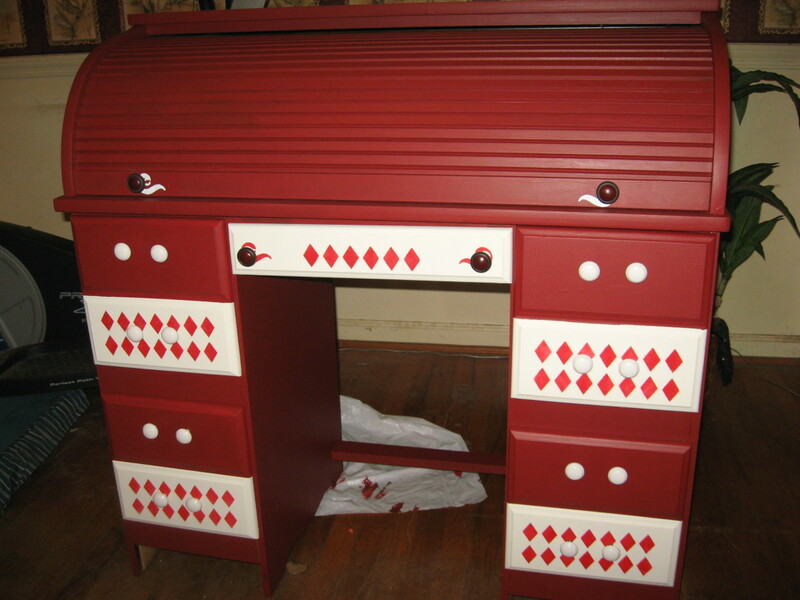 Harlequin, by the way, is very popular in French Country décor. Okay, you probably already knew that, didn’t you? See the frame above? I liked it so much I painted a picture just to go in the frame. 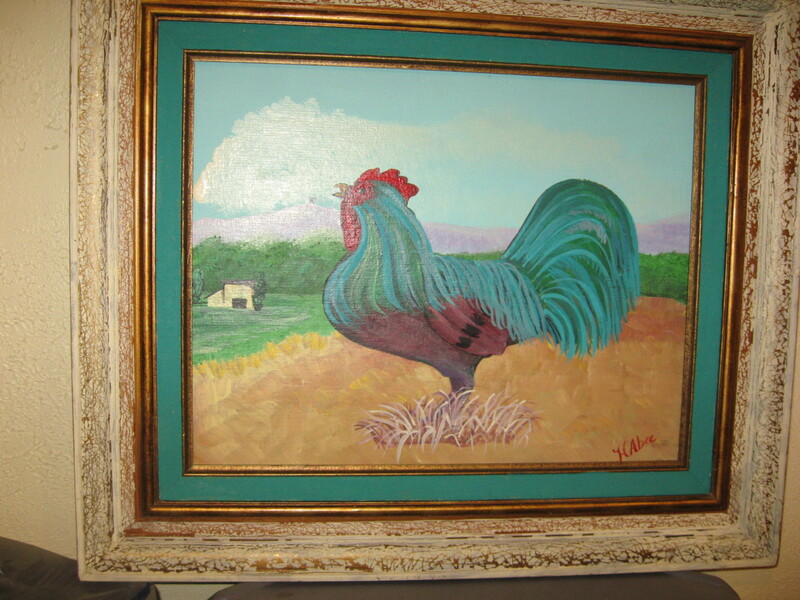 I chose to do a brightly colored rooster for my breakfast room. The frame was fun and easy to do. 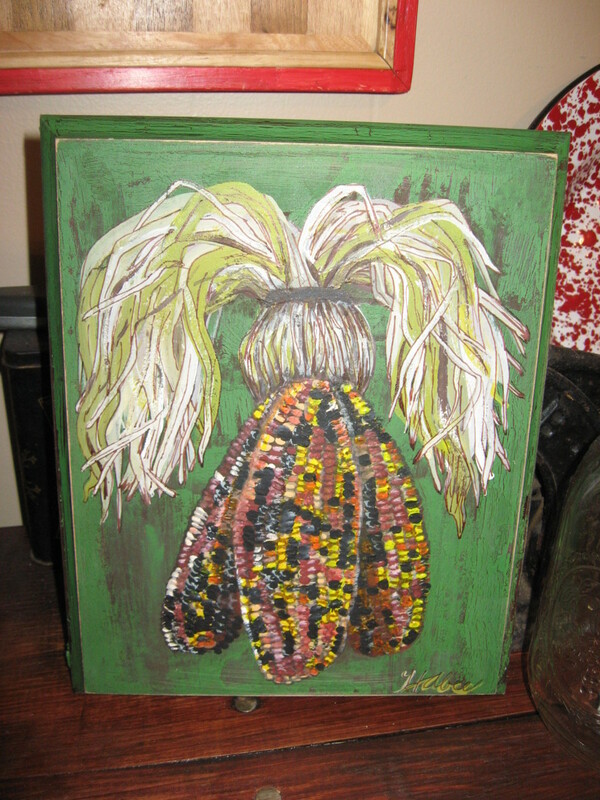 First, I painted the fabric matting with Annie Sloan Florence. I love this color! You already figured that out, huh? For the gold frame, I used a thick layer of antique white. When it was dry, I made hundreds of scratches through the paint, mostly in thin lines. I used a knife point for that. I also peeled off a little of the paint with a small pair of tweezers. I did all that while I was watching TV. If you want a crackle finish on a frame, use the glue method I already explained. If you want to use the peeling method only, you might want to stick with acrylic paint. it’s easier to peel off than chalk paint is. I didn’t seal the frame with wax or with polyurethane. 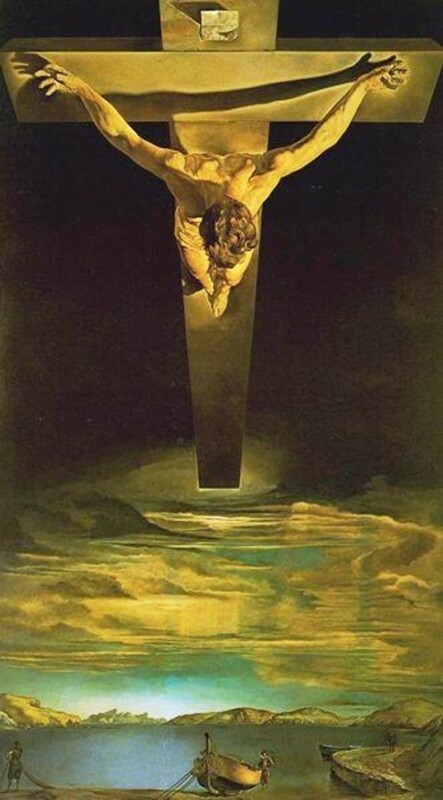 Since the painting will be hanging on the wall, it shouldn’t be in danger of getting wet, and it won’t be handled much, either. Actually, I wouldn’t mind if a little more paint was removed. Yes, my friends, you can use chalk paint on metal. I’ve had good luck doing so. 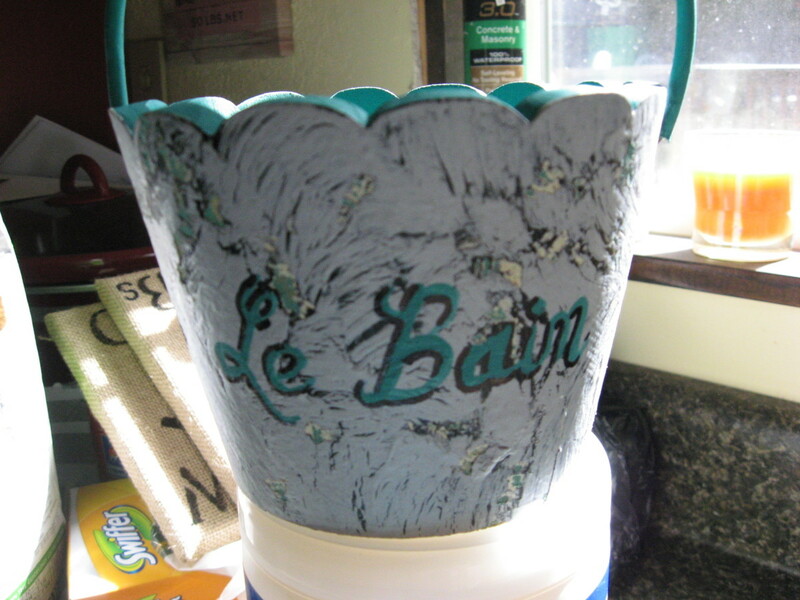 I bought some cheap milk pails from Walmart and dressed them up with chalk paint. On the first one, I used old white for the can. 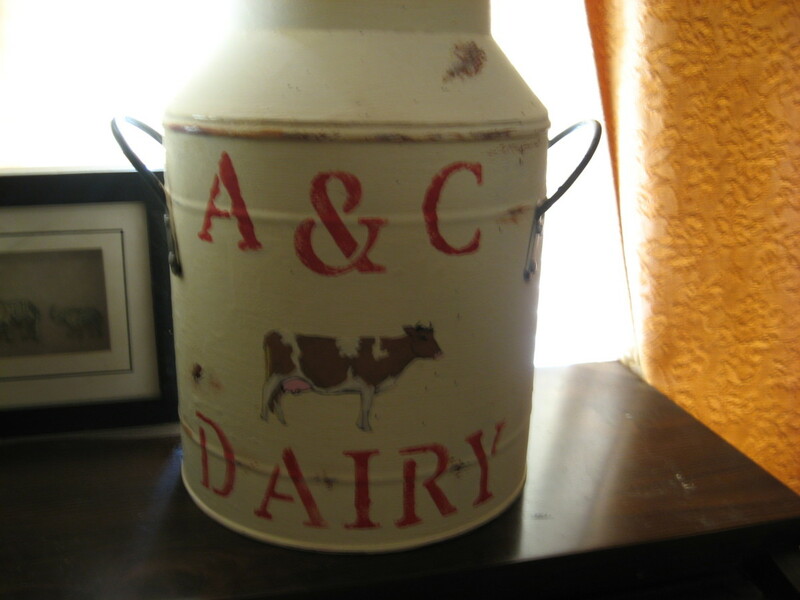 I stenciled on the name of a made-up dairy, and I painted a cow onto the front of the pail. I wanted the pail to show a little age, so I decided to make some “rust.” I used a small amount of burnt sienna acrylic artist paint on a dry brush and just dabbled the brush in random places. I rubbed the finished product with dark wax. I'm not sure if you can tell from the photo, but the pail has a really nice patina. 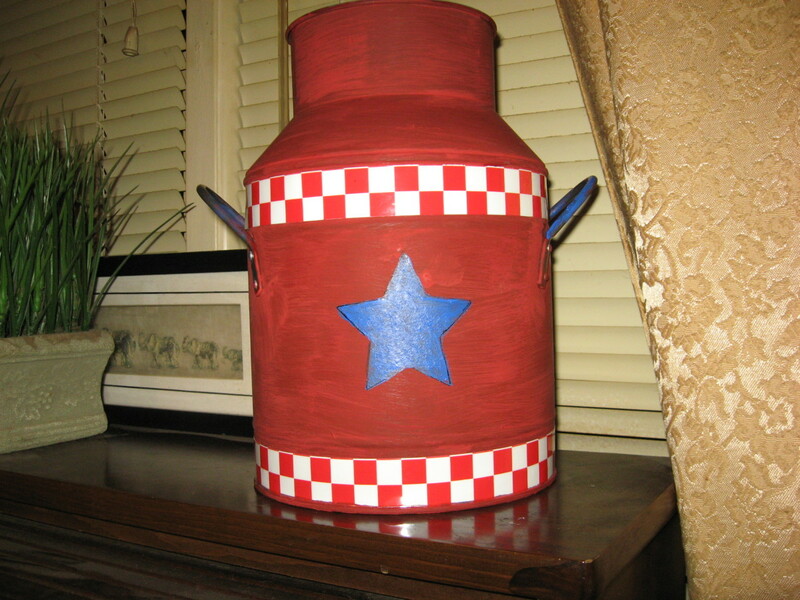 On the second milk pail, I stenciled on a star and used a red-and-white checkerboard pattern. What did I use? I swiped some of the trim hubby uses on his radio-controlled model airplanes! Shhhhh…don’t tell him! 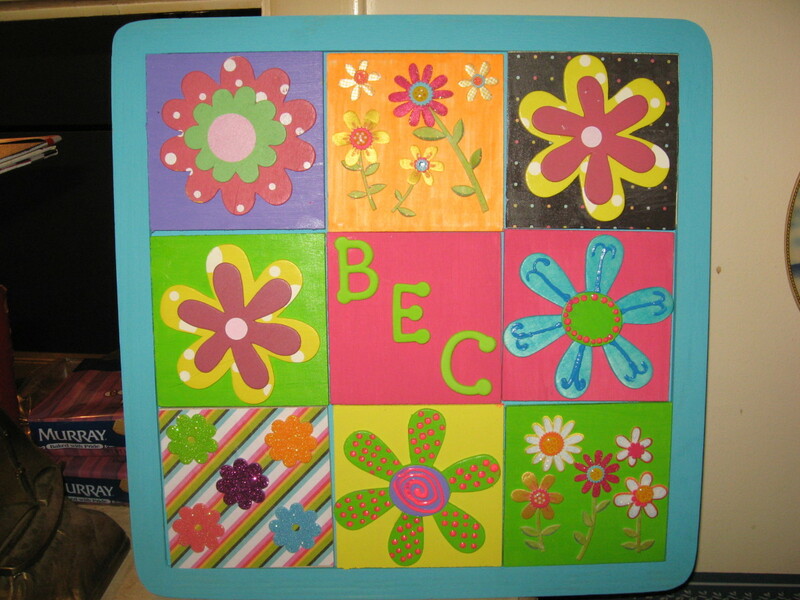 On the wooden mirror plaque with three hangers, I used chalk paint and acrylic paints. The chalk paint worked great on the three hangers, which are metal. The metal flowers did take three coats, each, however. Chalk paint works well on wicker, just as it does practically everywhere else. You need to make sure the wicker is clean first, however. Dirt and dust can easily be trapped in all the holes and crevices, so they need to be removed before you begin painting. The best way I’ve found to do this is by using a hand-held water sprayer – one with a good amount of water pressure. 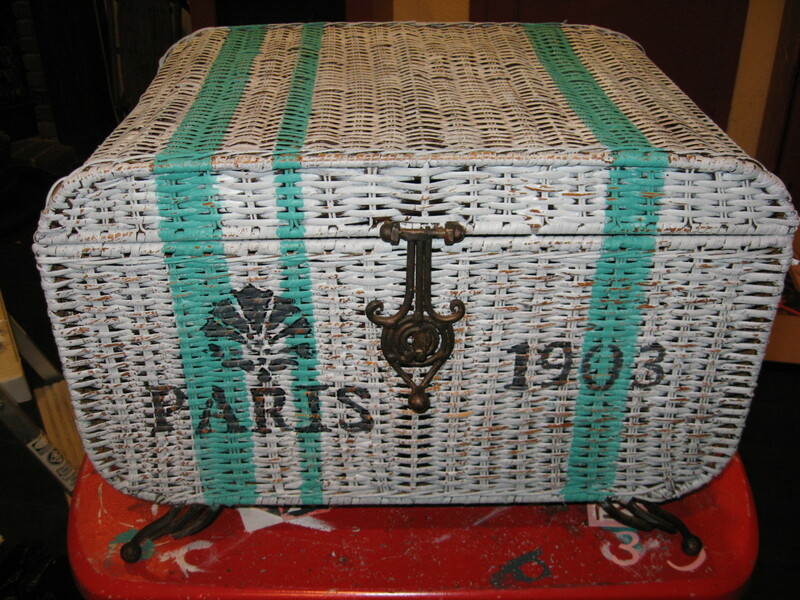 When the wicker is clean and dry, you can paint it. How you paint will determine how much coverage you get. How much do you want? In other words, how much of the natural wicker do you want to show through? On the wicker chest above, I wanted some of the dark wicker to be seen, so I used a medium-size brush with moderately stiff bristles. I slanted the brush to almost flat, as I didn’t want to get paint in all the weave. To do that, you’d need to use more of an up-and-down motion. 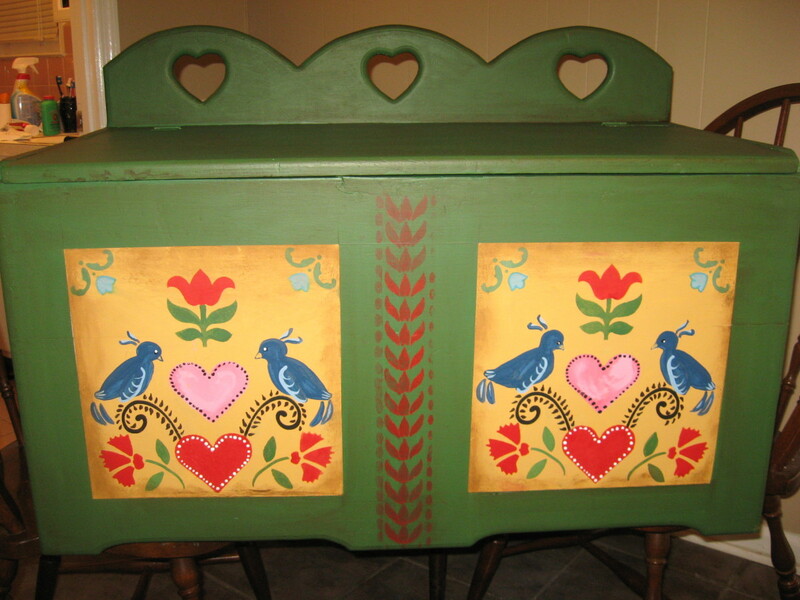 Once the chest was painted to my liking. I decided to add three stripes. I used Annie Sloan Florence for that. I still wasn’t satisfied, however, so I added a stenciled design, “Paris,” and a date. I told you this stuff could stick to just about anything and everything, didn’t I? I found out that it also adheres to marble – with just a little prepping first. For the two marble-topped tables in the photo, I used a dark shade of burgundy chalk paint to cover the wood. For the marble tops, I first cleaned them well with bleach water. Then I sanded them some. Lastly, I cleaned them with acetone. 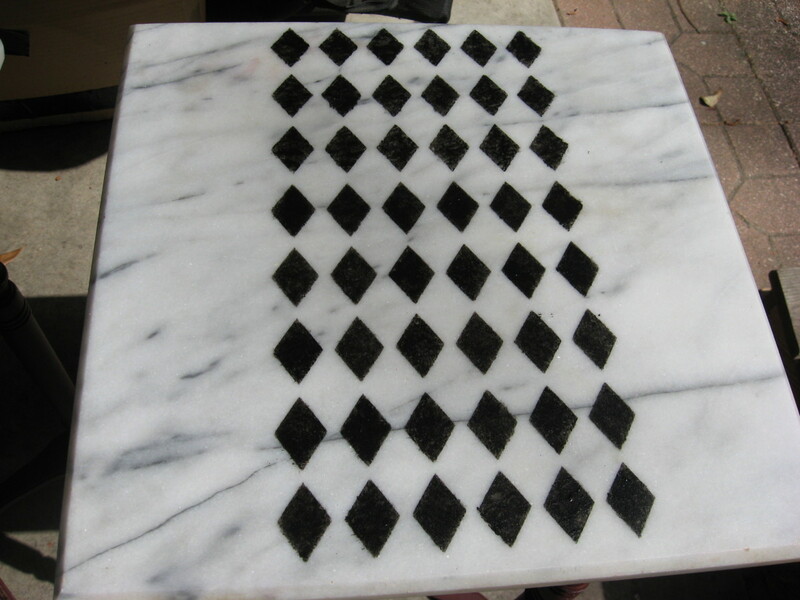 I used a stencil to make a harlequin pattern on the marble, with black acrylic artist’s paint. When it was totally dry, I sprayed on several coats of polyurethane, but I didn’t use any wax on the marble. The designs are holding up well! 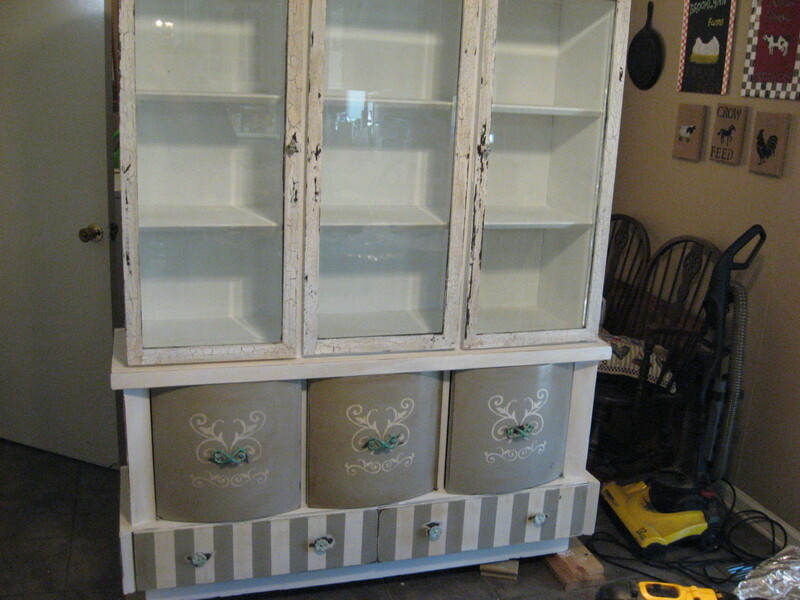 Don’t think you have to use all chalk paint on your shabby chic and other types of creations. I often use a mixture of chalk paint and acrylic paint. Sometimes I even use regular latex paint, too. 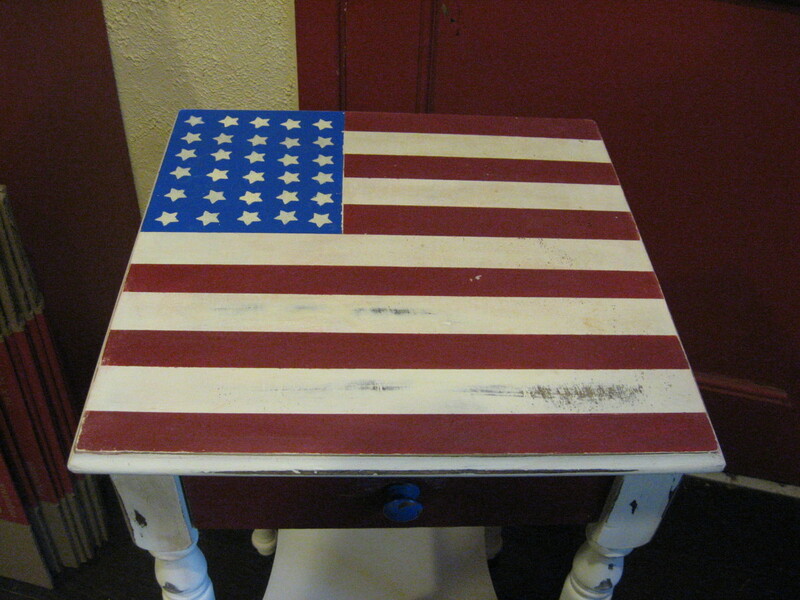 See the photograph of the table with the American flag on top? I used chalk paint on the entire piece. Then, for the flag, I used chalk paint for the white stripes, latex paint for the red stripes, folk art paint for the blue field, and acrylic artist’s paint for the white stars. The dark wax helped to age the bright acrylic and folk paints. 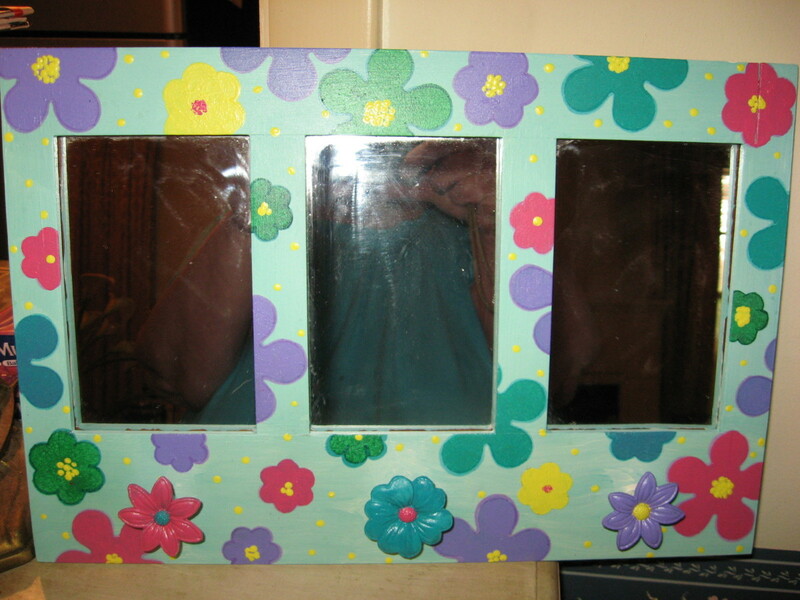 See the wooden square with the flowers? I used Florence chalk paint for the frame and base, but I used folk paint on the individual squares. For some of the flowers, I used acrylic artist’s paint. All the paints I use are water-based, and I haven’t had any problems so far. No matter what you paint with chalk paint, it most likely needs to be sealed and protected. Obviously, you don’t want the painted surface to be ruined every time it’s exposed to moisture. For this, I use a paste wax. I just rub it on, then wipe it off. Also, in almost every case, I add another coat of wax. For that, I use a dark wax. 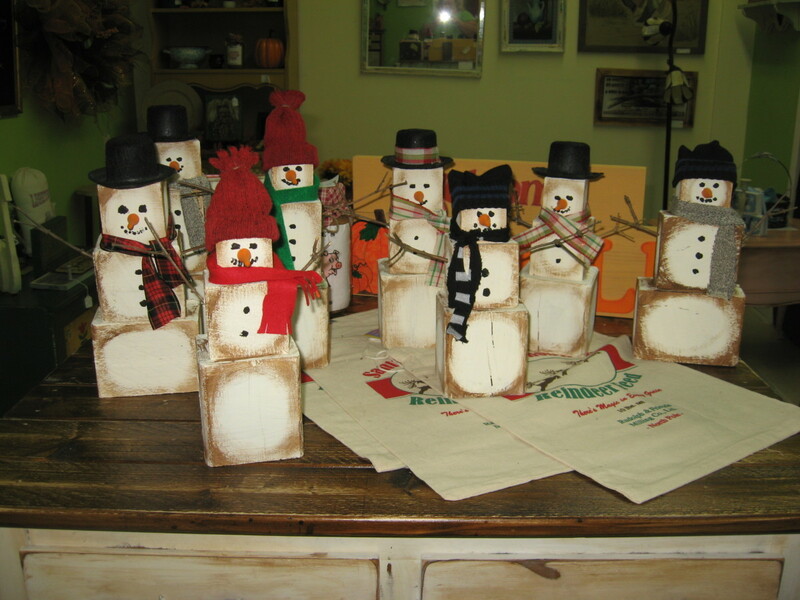 You can use Annie Sloan dark wax, or you can create your own. Believe it or not, I usually make my own with clear paste wax and brown shoe polish – the wax kind that comes in a flat tin. Sometimes I make dark wax by mixing together the clear wax and some burnt umber or raw umber artist’s oil paint. don’t use acrylic paint for this! Water-based paints won’t mix well with paste furniture wax. Whenever I have a piece that’s going to get extra wear and tear, I add another layer of protection. I use a coat or coats of satin polyurethane. I like to use the spray-on kind, but you might prefer the brush-on kind. The children’s table I painted will most likely get some rough use by kids, so it needs extra protection. 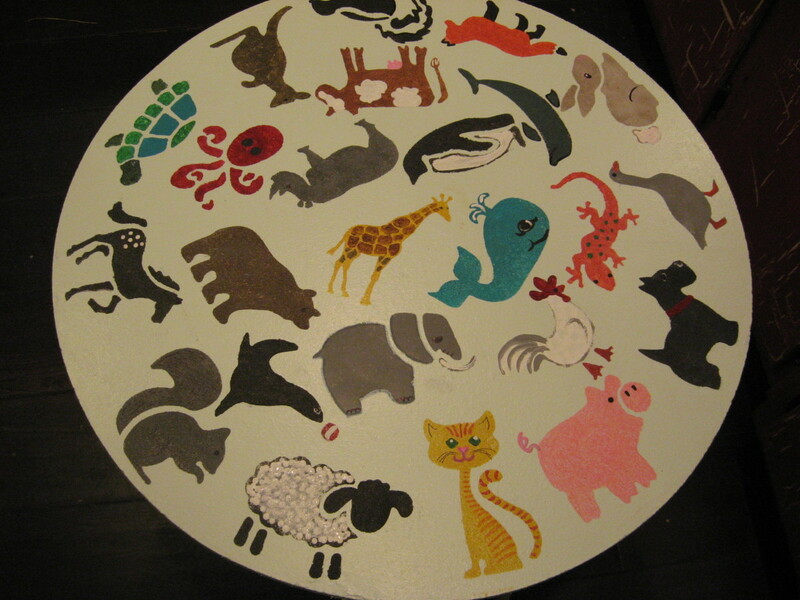 Of course, I don’t want the little details I added to the animals to chip away, either, so the table top will get several coats of polyurethane. T, I think it depends on the surface. Have you tried using 2 coats? You might want to mix in a little black. I have a question. It seems like Graphite goes on a lot lighter than it looks, is that so or a mix of pure white or primer underneath the chosen furniture? Yep, I did all the pieces in the photos! Wow! This is so interesting! You did all of these? What a great painting job! I've never tried chalk painting before but after reading this, you have convinced me to give it a try! Thanks for sharing! Rated up, interesting and beautiful! Loving chalk painting. You have some marvelous furniture improvements featured here. Great article and really informative!! Like the DIY ideas. Also read your other hub for beginners. Haven't tried my hand at chalk painting yet but think I will soon. Love the kids table you did. I've got an old solid wood blanket chest that's been around in the attic and all other places for out of site storage that I want to make into a toy chest for my grandson. The animal stencils would be great idea for. Voted up all the way!!! Not having to sand and strip is appealing, and it looks great on a variety of surfces. Thank you for sharing. Wow, you really expanded this! Great information and I still want to try chalk paint. Thanks for sharing!